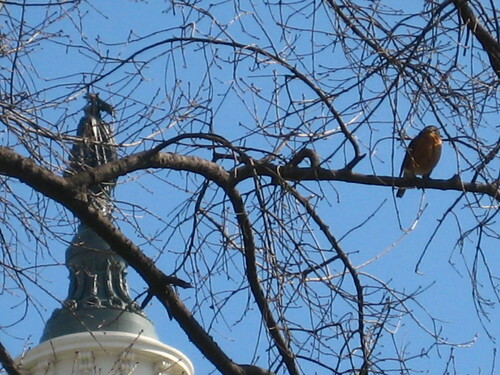 On an afternoon walk last weekend, Amy and I spied more than a few red-breasted robins, and several small yellow birds hanging out in the still-bare branches of an old oak by the Capitol. 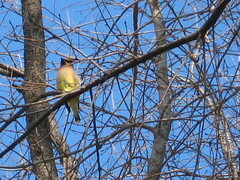 WhatBird.com tells me the yellow birds are American Goldfinches, though there were a few with crown-like fringes on their heads which don’t match the illustration — but that might have just been wind-blown feathers. 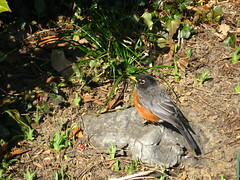 In any case, it was a pleasure to see these around rather than the usual pests — starlings, grackles, and sparrows. 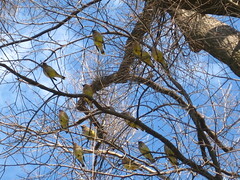 The robins and goldfinches certainly sounded more melodious. I was going to definitively answer your question as to their identity, until I realised American Goldfinches aren’t the same as their british cousins / second cousins / unrelated species sharing the same name. 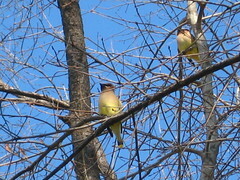 They are Cedar Waxwings. Beautiful, no?